Are your kids preparing for the Utah CRT, UBSCT, Utah DWA, or ITBS? All these standardized tests are part of the Utah Performance Assessment System for Students, known U-PASS. Utah U-PASS tests measure the progress of students from second grade through high school and provide actionable data to help parents, teachers, and students improve academic performance. Utah U-PASS is also used by the Utah State Office of Education (USOE) in evaluating each school’s Adequate Yearly Progress (AYP) as required by the federal No Child Left Behind Act (NCLB). Time4Learning and Time4Writing are two online services that teach many of the USOE designated skills. We offer this page to support your research on the best ways to help your kids with Utah CRT, UBSCT, Utah DWA, and ITBS practice and preparation. Utah CRT-ELA (English Language Arts): 2nd, 3rd, 4th, 5th, 6th, 7th, 8th, 9th, 10th, and 11th grades. Utah CRT Math: 2nd, 3rd, 4th, 5th, 6th, and 7th grades, as well as course-specific Utah CRTs in algebra 1 and 2, geometry, and pre-algebra. Utah CRT Science: 4th, 5th, 6th, 7th, and 8th grades, as well as course-specific Utah CRTs in earth systems, biology, physics, and chemistry. The Utah DWA is given to students in 6th and 9th grades. Tenth grade students take UBSCT tests in reading, writing, and math, and must pass in order to graduate. The USOE also administers the Iowa Test of Basic Skills (ITBS) to 3rd, 5th, and 8th graders, and the Iowa Test of Educational Development (ITED) to 11th graders. The ITBS and ITED assess students in reading, language arts, math, science, and social studies. These are nationally standardized, norm-referenced achievement tests, which measure Utah students’ performance in relation to the performance of students across the United States. The Utah CRT, UBSCT, and Utah DWA assessments are all criterion-referenced tests based on Utah Core Curriculum standards. As criterion-referenced tests, your child will only compete against him or herself, rather than be compared against other test takers, as with norm-referenced tests. Utah CRT and UBSCT tests are rated on a 4-point scale that shows how well students have mastered grade-specific skills, with levels 3 and 4 indicating proficiency. High school students pass the UBSCT if they score at level 3 or above. The Utah Direct Writing Assessment is scored based on students’ mastery of six writing traits: ideas and content, organization, voice, word choice, sentence fluency, and conventions. ITBS and ITED scores are expressed as percentile ranks, based on the scores of all students in the same grade nationwide. For example, a percentile rank of 75 means your child scored as well or better than 75% of students who took the test across the country. The national average for all schools is 50. Utah uses a balanced range of assessments to promote learning for all students. Utah’s Alternate Assessment (UAA) is designed to measure the progress of students with severe cognitive disabilities. All students with Limited English Proficiency (LEP) take the Utah Academic Language Proficiency Assessment (UALPA), which measure progress in English language acquisition. 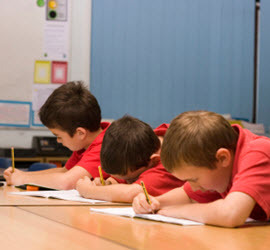 Utah also participates annually in the National Assessment of Educational Progress (NAEP), known as the Nation’s Report Card, where a sampling of students (from grades 4, 8, and/or 12) are tested in several content areas as part of a nationally representative assessment of student performance. The real preparation for the Utah CRT, or any standardized test, begins with your commitment to your children’s education throughout their school years. Devote time and effort to helping your children learn. Start by making sure your kids do their homework and read every day. Many families also employ tutors or an online learning program, such as Time4Learning, to build fundamental skills.